The Work Centre is a provincially funded, community based non-profit program which assists individuals in overcoming obstacles to securing and maintaining employment. 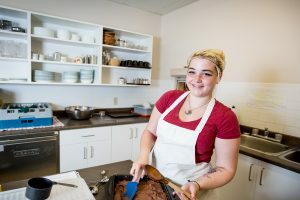 Our programs offer a unique, blended approach to training that combines technical, employability and essential skills instruction and development. Our mission is “Helping People Realize Their Potential” and we play a key role in helping individuals reshape their lives, focus on their strengths and reach their goals. The Continuing Care Assistant program trains participants to provide client care with home support agencies, in long term care facilities, as well as in acute care settings. Learning to care for an individual’s home environment, their meal preparation, and specific personal care procedures are components of this training. Four clinical work practicums provide each trainee with on the job training. This practical portion of the Continuing Care Assistant program, will take place in relevant and appropriate care facilities, providing students with the opportunity to put into practice the skills, knowledge and training they acquire. Hospitality/Food Services provides trainees with an orientation to entry level positions in the hospitality and food service industry. Environmental Services provides individuals with marketable skills in the field of environmental services and light building maintenance. This encompasses a curriculum that includes modern and relevant methods and procedures. In addition, all participants receive practical work experience in the field. When ready, participants will spend six weeks working for a local business or organization in a work experience or job shadowing capacity. This work placement accomplishes the following outcomes for participants who are seeking meaningful employment: an opportunity to prove themselves to a prospective employer, and ability to increase job skills and self-confidence, an opportunity to solidify their training and to obtain a current and positive employment reference. Trainees participate in their chosen work exposure module: Hospitality Food Services, Environmental Services, Continuing Care modules. Participants also complete a Personal Development module and a personalized Academic/ Essential Skills module. The Personal Development module is designed to help participants develop the skills needed to address personal and professional barriers to employment. Topics covered in this module include: Self Esteem/Self Confidence, Healthy Relationships, Team Building, Problem Solving, Communication Skills, Conflict Resolution, Stress Management as well as Resume and Cover Letters and Interview Skills. In the Academic/ Essential Skills module, an individualized plan is developed by the participant and academic instructor to meet their specific learning needs. The plan can focus on essential skills in reading, writing and mathematics and/or applied skills such as computer literacy. Participants who wish to can use this time to prepare for their GED examination. To assist trainees in developing and meeting goals related to their objectives, regular sessions with an assigned Counselor are scheduled throughout the Futureworx program. To register or for more information call 902-895-2837. Site tours of our facility, programs and services, occur every Friday morning at our Glenwood location. If interested in attending a tour, potential participants and service providers are advised to contact us to confirm time and to reserve a space. Additional information sessions occur at other Futureworx locations once a month.